Molecular surgery of HIV with Tre recombinase: For the first time the effectiveness of molecular scissors (Tre recombinases) to specifically remove HIV is demonstrated in an organism. In collaboration with the Hamburger Heinrich-Pette Insitute (HPI) we could demonstrate a highly significant antiviral effect of the Tre recombinase in a humanized mouse model. 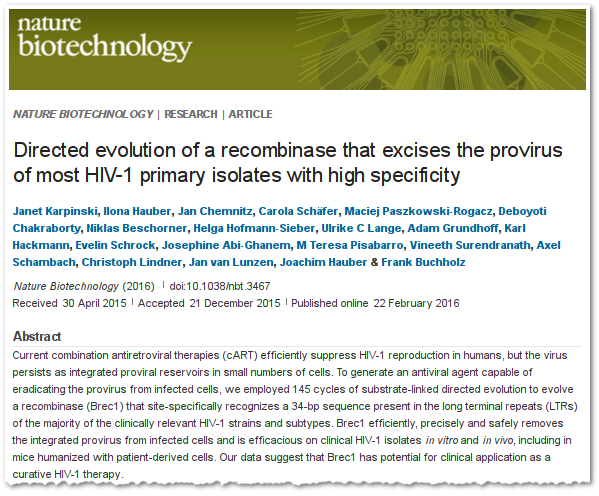 Previous experiments have already shown that the Tre recombinase has been effective to remove the HIV genetic material from HIV-infected host cells and thus reverse the infection. The current studies prove that the Tre recombinase can also remove HIV from infected human cells transplanted into mice without measurable side effects. These findings are an important step towards future clinical trials aiming at a cure of HIV. We have been working over 15 years in the field of site-specific recombinases to develop innovative HIV therapies. Worldwide, there are about 34 million people infected with HIV. …now over 199,000 views; more then any other manuscript ever published in PLoS Pathogens!